Chef Jose "JoJo" Ruiz is no stranger to the San Diego restaurant scene. JoJo began his lifelong affair with fish & seafood at the age of 16 when he took a job as dishwasher at Yokozuna’s. From dishwasher to prep cook to line cook, JoJo did it all in the Yokozuna kitchen. He even worked there full time while attending San Diego Culinary Institute. Chef JoJo’s impressive culinary resume took him to JRDN Hotel’s Tower 23, to Oceanaire Seafood Room, to Searsucker, to Herringbone, and to Ironside Fish and Oyster. During this time, JoJo also staged at different restaurants throughout the country and honed his craft. But it doesn’t always have to be about fish. One of Chef JoJo’s favorite meals, made by his girlfriend's mother, is a straightforward and flavorful dish of braised lentils, fried plantains, pork and steamed rice. He’s also known to enjoy such simple fare as anchovies and sardines. This extensive experience, coupled with his talent and passion for fresh seafood made Chef JoJo Ruiz the ideal candidate for the Executive Chef position of Clique Hospitality's forthcoming Lionfish Modern Coastal Cuisine. Located within the Pendry, Lionfish opened in the heart of San Diego’s Gaslamp in February with Chef JoJo at the kitchen’s helm. 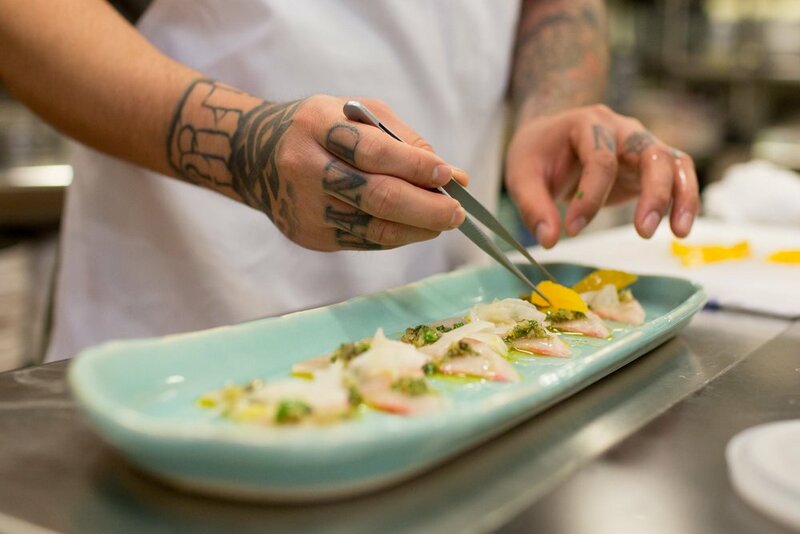 When asked what sets Lionfish apart from other restaurants in San Diego, JoJo explained that their food is technique driven and precise which elevates each dish. He has also expanded on bringing the dock to the table - going to the docks daily to purchase fresh fish for the day. The importance of using responsibly sourced items extends from the sea to the land; their meat is non GMO, antibiotic free. Additionally Chef JoJo is inspired by ingredients of the season, so expect the Lionfish menu to change seasonally. This writer recently had the opportunity to indulge and enjoy dinner at Lionfish. As a night on the town, birthday celebration, friends and family met a Lionfish for a no holds barred dinner extravaganza. The Lionfish menu is elegant yet approachable, and encourages you to savor and share multiple dishes, which is exactly what we did. From Lamb Tartare and Crispy Rock Shrimp, to multiple Sushi and Sashimi rolls, to Salmon and Duck Breast and more - our group ordered it all. As a vegetarian I worried that such a seafood forward menu meant that I was destined to stick with bread and wine all night, but that was not the case. The service was wonderful, and both our server and the kitchen ensured that I would leave the table full. This was indeed the case after I gobbled down the beautiful presented - and very original - roma tomato topped vegetable sushi roll, which is not on the menu but the kitchen deliciously accommodated. Vegetarian roll aside, for the rest of the party the meal's highlight was definitely all the fresh and different seafood dishes. To continue the evening, we made our way upstairs to another of Clique Hospitality's venues within the Pendry. The Pool House offers a chic and relaxed rooftop ambiance. During the week, their Rooftop Social happy hour features $1 Oysters + 1/2 off wine, cocktails and apps from 5-7pm. Because it was Thursday night, we enjoyed the debut party of UNWINED - Halfway Home which also offers free entry to Oxford Social Club. And so we ended the night relaxing by the pool before dancing off 3 courses worth of deliciousness. A big thank you to Lionfish & Chef JoJo, The Pool House, Oxford and Clique Hospitality for a wonderful experience! Photos from Lionfish, Pool House, and Oxford Social Club.